Early June on Maui served up a short string of days where conditions for Maliko were exceptionally enjoyable. These weren’t days with super strong winds and macking surf. One of the days turned out to be so enjoyable that I found myself analyzing why the conditions were so fun. It was a day that I’d decided to paddle my OC1 rather than my standup, because, with the wind being in the mid 20’s, I knew the potential to go fast would be a lot higher in the boat. Okay, maybe I’m getting a little lazy or maybe I’m just addicted to the speed and excitement of paddling a slightly faster craft. Several years ago, when I first started to downwind in the OC1, it felt like being in a go kart. You sit almost right on the water, the boats are light, stiff and very responsive, which combine to enhance the sensation of speed and quickness. Because of the low drag of the hull, waves that would be difficult or impossible to catch on a stand up board can be had with four or five focused power strokes. If you steer well, once you have the speed from catching one bump, you can likely catch another one. String three or four together and you’ve just covered a lot of distance with very little effort other than trying to keep the grin off your face. After three years of paddling the boat, I’m enjoying the experience more and more. Balance now comes more naturally. Bracing with the paddle to avoid a tip over or ‘huli’, has become automatic. Bracing is a simple but extremely important skill whether you’re paddling OC1 or SUP. In the canoe, it requires the paddler to use the paddle’s blade face on the right hand side of the boat for stability. You brace when you put too much weight on the right side by accident or when you intentionally lighten or fly the ama (the pontoon that is attached to the left-hand side of outrigger canoes) to decrease drag. As with stand up paddling, once you’ve learned the basic skills, you can devote more energy to having fun and going faster. You’re no longer focusing on just staying upright. Instead, after some time on the water, you can work on subtle refinements to your steering and paddling to achieve the ultimate goal of maximizing glide time. But whether it’s on a stand up board or in a canoe, you have to adjust your inputs to the conditions. That means you tailor your paddling, balance, steering, and trimming fore and aft to what the water is doing. 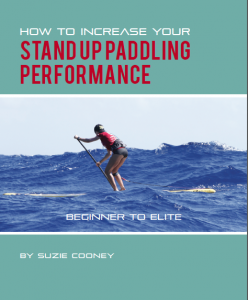 Many paddlers refer to that process as ‘reading the water’ or getting into rhythm with the conditions. The ever-changing variables include wind velocity, ground swell size and direction, how far the wind has been blowing on open water (called ‘fetch’); the amount of time it’s been blowing, the water depths, bottom shape, the tides and even more. When you paddle the same run over and over in a variety of conditions, you learn what to look for. Eventually, people begin reading the conditions more effectively and use the ocean to go faster than they ever could on their own. Regardless of whether it’s small or huge, Maliko can often have complex conditions resulting from multiple swells coming from several directions. A good paddler who can read the conditions may be able to use what looks like disorganized chaos to their advantage. Sometimes though, it really is just that – messy and bumpy and difficult to get in synch with the swells. It’s not unusual to have a wind swell traveling from east to west, parallel to the coastline. There may be one or more groundswells coming from several directions. Groundswells are generated by storm systems hundreds or even thousands of miles away. Finally, there are swells that result from waves hitting the shoreline and bouncing off, back out to sea. All of these swells have different characteristics in size, direction and power. Often, even if the wind is favorable, competing or conflicting swells can make for messy and challenging conditions. Getting that rhythm with the bumps just doesn’t happen. On those days, you’ll hear people saying that the conditions are ‘crossed up’. Crossed up days don’t typically allow for fast runs. You might be heading down a wave face when you suddenly see another swell traveling at you like a moving speed bump in the water. You may lose most of your speed or even have yourself a little swim resulting from an unplanned get off. It can be tough to link any bumps together because it’s just too messy. Some days, the counter currents are so strong that it can be tough to stay on a single bump, let alone link anything. So, why was early June so much fun? Certainly there are plenty of days with similar winds in the mid 20’s. But, these were a string of days that were especially fast and fun. I think the answer is that all of the factors that influence the conditions were just right. The east to west wind swell was small and consistent, three to maybe five feet at most. A small swell from the northeast was also present as was the small swell reverberating off the coastline. Nothing was coming from the north or northwest, the directions that long-period winter swells typically originate from. The three smaller swells were just the opposite of crossed up conditions. You could chase and catch swells in all three directions. Catch the small reverb swells and work to the right and outside, paddle for the NE swell that was being enhanced by the easterly wind swell and you could get some fat glides back inside to the left. Using the rudder was like having an accelerator pedal. Catch a swell going out to the right, add a little left pedal and catch the now forming big drop to the left. Because the swells weren’t conflicting with one another, all the directions were fun and productive for gliding. Even with amazing conditions you find yourself not always going exactly the direction you think you should, but you are moving towards your destination and every little push helps. Sometimes you capitalize on a good gliding opportunity and jump far ahead of where you expect. Other times, you miss something that you should have gotten. But you don’t give up because you know another chance is coming right up. And when you’re able to catch so many glides, the stoke-o-meter gets pegged on high. Sometimes, you just paddle and don’t even see the glide coming but a trough begins to form and all of a sudden, you’re back in the bump hunt. That’s why early June was so much fun for me, there were no distractions, just total focus on catching the clean waves and generating speed. As I paddled down Maliko, catching glide after glide on one of those days, I realized how special and unusual it was to have everything working so well. There are very few days, at least for me, where I feel like I know what I’m doing on a Maliko run. But, once in a great while, patience and persistence are rewarded and you score some of these perfect days. When there are several in a row, you might even be tempted to think you’ve begun to master the run. Don’t worry, Maliko and momma ocean will always make sure you have humility. You’ll find yourself getting spanked in a crossed up ocean again in no time. We welcome comments and your thoughts about navigating Maliko. Please share the stoke. Great read Gregg! You made it easy and fun to visualize the Maliko run and getting spanked – enjoyed. Thanks very much for stopping by Maliko Run and sharing your thoughts about Gregg’s article. Yes we love this article and how good explains the ways of Maliko! Good stuff! Have a great summer. Stay tuned for much more here. Glad you enjoyed it! Fun to write about all the great days out there, big or small! Most excellent! Great explanation of the conditions that can affect Maliko! Thanks for reading Lisa. You always have to adapt to whatever the ocean throws down and you never know what you’re going to get until you go! Miss seeing you out there!